BACKGROUND AND PURPOSE: Thyroglossal duct cyst remnants (TGDC) are a common midline neck mass that is mostly encountered in childhood. Enlargement after an upper respiratory tract infection or, rarely, cancer within TGDC, is a well-documented phenomenon. In the pediatric population, it rarely presents a diagnostic quandary. However, in an adult population, especially one treated for head and neck cancer with radiation therapy (RT), any enlarging cystic mass would be concerning and would raise the specter of metastatic disease. We propose that inflammation associated with RT results in secretory stimulation and/or obstruction of a persistent thyroglossal duct, resulting in changes within a pre-existing TGDC. 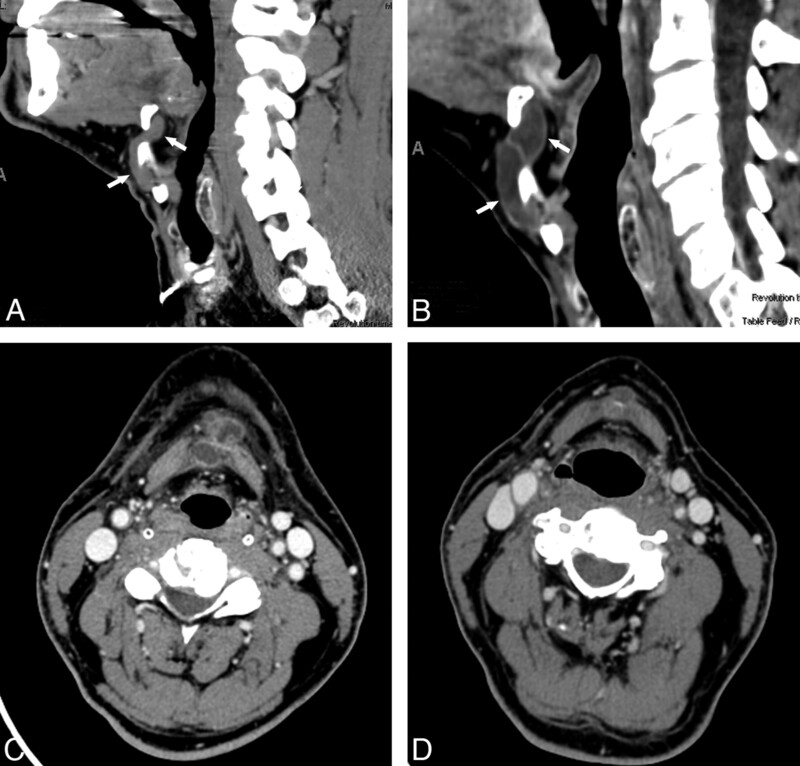 MATERIALS AND METHODS: We present a case series of 8 patients with subclinical TGDC treated with RT for various head and neck cancers, in which we radiographically observed enlargement or cystic transformation (more cystlike appearance) of the cyst. RESULTS: In all patients there was in retrospect a small thyroglossal remnant, though not necessarily a discernible cyst, that was observed after radiotherapy to enlarge and become more cyst-like. CONCLUSIONS: In patients with pre-existing TGDC undergoing RT to the neck, enlargement and cystic transformation may be encountered radiographically and should not be misinterpreted as a tumor. Our series bolsters a recently reported description of the same phenomenon. The purpose of this report was to present the cases of 8 patients in which we observed enlargement, or a more clearly cystic appearance, of TGDC after RT for various head and neck cancers. To the unwary eye, enlargement of a mass after RT, or what seems to be a new lesion, might suggest a cystic metastasis. These cases are presented to illustrate a potential pitfall in the interpretation of postradiotherapy imaging studies in the head and neck cancer population. A retrospective analysis of 8 patients who had undergone RT for various head and neck cancers (5 with oropharyngeal squamous cell carcinoma, 1 with parotid mucoepidermoid carcinoma, 1 with thyroid carcinoma, and 1 with nasopharyngeal carcinoma) was performed with contrast-enhanced CT (7 patients) and MR imaging (1 patient). For each patient, the imaging technique was the same before and after RT. The CT parameters were section thickness, 1.25 mm; spacing, 1 mm; kVp, 140; and mA, 200. All images were reviewed by an experienced head and neck radiologist (L.E.G.). Determination of TGDC was made by characteristic location and lack of other worrisome signs (eg, solid enhancement). Patient data are listed in the accompanying on-line Table. All except 1 patient had undergone intensity-modulated RT (IMRT). One patient was treated with postoperative irradiation for parotid salivary cancer with an ipsilateral electron beam technique. The IMRT treatment plans of involved patients were dearchived. The pre-existing TGDC was contoured, and the dose to the cyst was calculated and tabulated in the on-line Table. The pre-existing TGDC was in the RT field for all patients, as was the expected course of the TGD. Post-RT imaging took place at varying intervals ranging from 4 to 14 weeks after completion of RT (on-line Table). In all except for 1 patient, TGDC were not reported on initial scans. However, on retrospective analysis, all had small TGDC on the pretherapeutic scans (Figs 1 and 2). After RT, all cysts became more fluidlike (lower in attenuation values by measurement and visually; see the on-line Table for attenuation values before and after RT) and demonstrated rim enhancement or a more prominent rim on CT scanning that was not present before RT. Rim enhancement could not be evaluated on our 1 patient who underwent MR imaging examination because the postcontrast sequences did not cover the region of the cyst. In all patients, the cyst enlarged relative to the pre-RT appearance. A 36-year-old man before and after IMRT for treatment of a T3N2C right base of tongue squamous cell carcinoma. A, Axial, contrast-enhanced CT image before RT shows a small, oval-shaped mass behind the left side of the hyoid bone (arrow). B, Axial contrast-enhanced CT image 43 days after completion of RT shows that the cyst is slightly larger but has a more cystic appearance, being of lower attenuation and possessing a more distinct rim (arrow). A 54-year-old man before and after IMRT for treatment of a T2N2B base of tongue squamous cell carcinoma. A, Sagittal reconstructed image of a contrast-enhanced CT series before RT showing an isodense structure coursing from a location posterior to the hyoid, anteroinferiorly through the thyrohyoid membrane, and finally into a position anterior to the thyroid cartilage (arrows). B, Sagittal reconstructed image obtained 30 days after the completion of RT. The lesion is clearly larger and more cystlike (arrows). C, Axial, contrast-enhanced CT image obtained 7 months after the image in 2B, during an asymptomatic period. The cyst appeared more complex and irregular, with suspected inflammatory changes peripherally and in the nearby platysma muscles. Infection was suggested. Results of an ultrasound-guided biopsy revealed a benign cyst. It was finally hypothesized that self-massage for the purpose of improving lymphatic drainage and alleviating edema caused irritation of the cyst and the adjacent soft tissues. D, Axial, contrast-enhanced CT image obtained 90 weeks after RT. Inflammatory changes had long since resolved, and the cyst is both smaller and less conspicuous, as was generally the case with our series of cases. In the follow-up period ranging from no follow-up to 164 weeks, all cysts ultimately demonstrated a decrease in size, some to near pre-RT size, and all were visually less conspicuous. One patient's cyst during the period of follow-up demonstrated further enlargement along with pericystic inflammatory changes, and a diagnosis of TGDC infection was posited (Fig 2). Although the patient was asymptomatic and was without clinical signs of infection, the finding of cyst enlargement was concerning to the referring clinician. A sonography-guided biopsy was performed; microscopic analysis revealed proteinaceous fluid and histiocytes, and a diagnosis of a benign cyst was made. It was considered possible in this case that manual self-lymphatic drainage, recommended as a treatment of RT-related lymphedema, may have resulted in some irritation or inflammation that caused this cyst to appear inflamed. The inflammatory changes subsequently resolved, and the cyst became smaller but remained larger than it had appeared before RT. The remaining cysts were followed with CT or MR imaging, and no intervention was undertaken. Enlargement of TGDC after an infection, or in the rare case of carcinoma within the cyst, is a well-documented phenomenon.2 However, enlargement after RT for head and neck carcinoma is a newly discovered phenomenon and is believed to have an inflammatory cause.3 Unlike the case reported by Srinivasan et al,3 however, our cases did not appear to be de novo development of TGDC but, rather, a transformation of what, on careful review of the initial imaging, were clearly pre-existing cysts or, conceivably, TGD remnants that were dormant or were not yet cysts. The notion that this transformation represents an inflammatory response to RT is predicated on enlargement, rim enhancement, or prominence, and a more cystlike appearance. These are typical ways in which a cyst might respond to an insult—by increasing the rate of fluid production. This mechanism might reasonably be associated with a decrease in the ability of a cyst to drain along a presumably initially patent TGD, also a potential by-product of RT-induced inflammation or scarring. This latter idea is supported by our review of the radiation dose along the entire TGD tract. These doses ranged from 35 to 59 Gy. The largest size achieved by all cysts was in the immediate posttherapeutic scan. After RT, the evolution of all 8 TGDCs pointed to a benign phenomenon. Specifically, shrinkage or stability suggested the resolution of a previous inflammation, as might be expected with removal and resolution of the offending stimulus (RT). None of the cysts in our patients subsequently enlarged in size except for the 1 case previously mentioned that was believed to have been irritated further by self-massage; this lesion subsequently became quiescent (Fig 2). Although uncommon, midline nodal metastases, part of the so-called prelaryngeal nodes, can be seen in papillary thyroid carcinoma and advanced laryngeal malignant tumors.3 They are more commonly cystic in papillary thyroid cancer.8 Cystic nodes are also commonly seen in oropharyngeal carcinoma but are not typically midline.9 Although unlikely to have represented nodal metastases in our clinical setting, particularly because the tumor should be regressing in response to RT, nonetheless, radiologists will encounter developing or enlarging TGDCs in a busy practice. Enlargement of TGDC in response to RT is a newly discovered phenomenon that radiologists and clinicians should bear in mind to avoid misinterpreting an inflammatory phenomenon as a neoplastic one. In addition to being aware of this phenomenon, the radiologist should carefully examine pre-RT images, if available, to search for pre-existing TGD elements, which would make the plausibility of a reactively enlarging or developing cyst greater. Of course, the characteristic location and appearance (and detection shortly after therapy) in which a developing midline nodal metastasis would be oncologically incongruent are additional factors that should help to avoid misdiagnosis in this setting. Accepted after revision November 9, 2008.